To the Greeks, Selene was the Moon. To the Romans, she was Luna. She came out at night to drive her milk-white horses across the sky while her brother, Helios rested. Her pale moonbeams fell gently on the peacefully sleeping earth. One night, her soft light fell on a handsome young shepherd, smiling in his sleep as he lay beside his flock. She was so enamored with him that when she got back to the Olympian palace, she asked Zeus to grant this shepherd eternal sleep in which he would stay young and handsome forever. Zeus granted this wish, and the young shepherd dreamed that he held the moon in his arms. And he did! Selene bore him fifty beautifully pale and sleepy children. There is also another goddess associated with the Moon. Her Greek name is Artemis and her Roman name is Diana. She was the daughter of Zeus and the goddess, Leto and was the twin sister of Apollo. When Hera, Zeus' jealous wife,discovered that Leto was expecting twins, she ordered all the lands of the world to refuse Leto shelter. Exhausted, Leto finally came to a little island adrift in the sea where she thankfully rested and gave birth to her twins, Artemis and Apollo. To show his joy, Zeus gave each of them a silver bow and a quiver of arrows. Artemis was the firstborn, a beautiful, dark-haired girl, gentle and graceful. Her arrows were soft as moonbeams and caused a painless death, while those of Apollo were hard and piercing like the rays of the Sun. As a child, Artemis asked Zeus to let her remain a young maiden forever hunting in the woods, never having to marry. Thus she is the goddess of the hunt and patroness of unmarried girls and their chastity. Artemis could be cold and pitiless toward those who pursued her and in many stories she is said to be fierce and vengeful, even killing Orion. But she is also known as being gentle and tender, the protector of small helpless creatures. 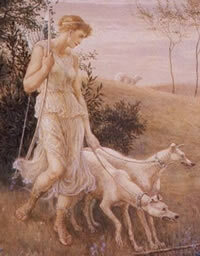 Both Selene/Luna and Artemis/Diana were known for having numerous love affairs and thus, are associated with fertility. The Moon represents the emotions and our deepest desires. There is a Paul Simon song that talks about how the heart approaches what it yearns. That is the essence of the Moon. It doesn't reach out and take what it wants. Instead, it looks longingly and waits silently for it to come to her. The Moon is classified as one of the Personal Planets. Emotions are responses to outside events. They are not easily controlled. The sign of your natal Moon tells about what kind of emootional responses you are likely to have and the degree of control you have over them. The house containing the Moon describes the focus of your deepest and dearest longing... your heart's desire. The Moon is Earth's natural satellite, orbiting the Earth at a mean distance of 238,857 miles above us. 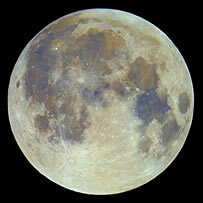 The Moon is a low-gravity, airless, waterless, lifeless world which has no atmosphere. 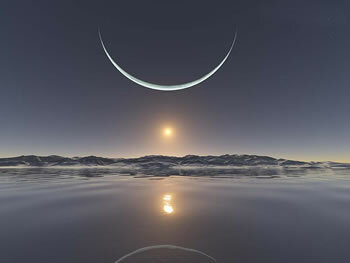 The "light of the Moon" is really only light that is being reflected from the Sun. The Moon travels a complete circuit around the Earth in a little over 27 ¼ days, but because the Moon is moving within Earth's own movement around the Sun, the period from one New Moon to the next New Moon takes a little over 29½days. This is known as a lunar month. From Earth, the New Moon is not visible. As it progresses through it's cycle, we first see larger and larger portions of the waxing Moon until it reaches it's halfway point in the cycle, when we see the Full Moon. This is followed by smaller and smaller portions of the waning Moon being visible until it once again becomes a New Moon.